As more students from the Chinese mainland pursue college educations in Taiwan thanks to warmer cross-Straits relations, they are increasingly being targeted by Taiwan intelligence agencies to work as spies, the Global Times learned recently. National authorities claim that mainland students at more than 20 Taiwan universities were enlisted by local spies between 2009 and 2013 through various means, such as providing work opportunities, in return for information on mainland political, economic and military policies. While the two sides have both benefited from strengthened ties, Taiwan-led espionage is working against this progress. The Global Times learned that nearly 40 such cases involving mainland students in 15 provincial regions have been uncovered in recent years. Lin Chao-wei, 31, served as a Taiwanese spy while posing as a graduate student at National Kaohsiung Normal University, according to relevant authorities. By participating in on-campus activities at various schools such as I-Shou University and YunTech, Lin befriended local students who would, at his request, introduce him to classmates from the mainland. More often, he would make contact by distributing questionnaires targeting new arrivals at public places such as train stations. Lin first would spend time and money on nurturing "friendships" with the mainland students. When he felt he had earned their trust, Lin would advance the relationship by pretending to work as a researcher or manager for companies seeking data to explore the mainland market. Lin would also hire mainland students through online recruiting websites, encouraging them to take the civil servant exam after they return home with offers of "exam preparation funds." Using his most common cover, Lin would ask students to collect "insider" policy information and internal government documents to help with his business. Many students may find it hard to refuse a friend, even though they often don't live up to the spy's expectations. "Forming an emotional bond is a key tactic for Taiwanese spies when connecting with mainland students," an anonymous mainland security official told the Global Times. "It establishes a stable foundation for their cooperation." Currently, short-term exchange students and trainees make up the majority of mainland students in Taiwan. In 2011, Taiwan began opening degree-seeking programs to students from six mainland municipalities and provinces, including Beijing, Shanghai, Jiangsu and Fujian, attracting more than 3,000 students. Mainland students are subject to a series of policies that prohibits them from working off-campus, applying for scholarships, registering for the Taiwan government employee exam and finding employment in Taiwan after graduation. These policies were exploited by Taiwan spies, who recruited students struggling to pay their average 40,000 to 50,000 yuan ($6,540 to $8,177) in annual expenses with part-time job opportunities offering "easy money." Tai Wei-kuang, 43, targeted mainland students who published articles in Taiwanese media while working undercover as an employee of a planning company in Taipei. Tai would make first contact with students through e-mail or chat platform QQ, with claims his company is hiring part-time creative writers for as much as NT$30,000 ($987) a month for articles on a variety of topics. After a period, Tai would lure students with even higher fees for articles on political, economic and military data. Similarly, Hsu Chi-chun, 29, another Taiwan spy, enticed students with up to 5,000 yuan a month for any internal government documents and magazines to be used by his "family-run company" seeking to invest in the mainland. He also encouraged students to "observe" mainland military airports, ports and military bases and report to him after returning home. While most students could not provide such information, some ended up delivering. In a recent case, a female student enlisted by a Taiwan spy managed to send off pictures of classified documents she obtained after returning home. She later delivered files abroad while her contact was stationed to Southeast Asia. Previously, Taiwanese intelligence agencies had six major intelligence-gathering and espionage taskforces. The intelligence work has developed as cross-Straits communications strengthened over the past decade, according to media reports. A work team led by Tai Wei-kuang has been recruiting mainland tourists, women who married Taiwanese residents and students since late 2011. The team members frequently attended mainland student parties, where they asked to be introduced to "more valuable people," such as supervisors. Many mainland students have also received questionnaires directly or indirectly from Taiwanese spies. The surveys usually begin with softball questions, such as their initial impressions of Taiwan, then probe further for possible government or military links. 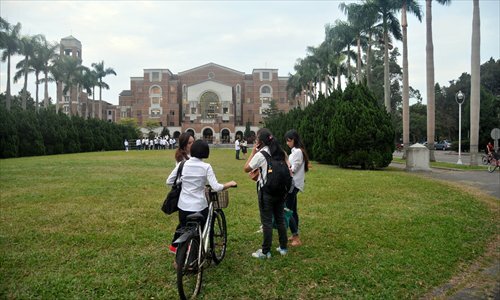 According to authorities, multiple spies were discovered working around National Taiwan University, National Tsing Hua University, National Central University and several other colleges popular with mainland students. About 11,000 mainlanders studied in Taiwan in 2012 alone, among them, 10 percent were on degree-seeking programs. Some students have reported being approached by intelligence recruiters to security authorities after returning to the mainland, an anonymous national security official told the Global Times. Mainland officials have requested Taiwan authorities to address the situation, yet such activities persist. "Such espionage activities that utilize students as targets go against the mainstream wish and should be strictly condemned," said the security official. Fan Liqing, spokeswoman of the Taiwan Affairs Office of the State Council, on Monday urged Taiwan to immediately cease such activities, which seriously inhibit cross-Straits educational cooperation and jeopardize the safety of students. Taiwan intelligence agencies, educational authorities and universities responded Monday denying knowledge of such activities. The authorities also denied reports that Tai was ordered to retire from the intelligence service, Taiwan media reported Tuesday.